We’d love your help. Let us know what’s wrong with this preview of Charlene the Star and Hattie's Heroes by Deanie Humphrys-Dunne. To ask other readers questions about Charlene the Star and Hattie's Heroes, please sign up. Yet another wonderful children’s story from Ms. Dunne about how dreams, hard work, and determination eventually wins the day. Children often feel they are the only ones facing challenges, things are always easier “for the other guy,” and they never are going to amount to anything. And of course, with children being children—which is to say, being capable of saying and doing cruel things (in the story, one horse kicks up mud in another’s face during a race)—situations involving competition can tu Yet another wonderful children’s story from Ms. Dunne about how dreams, hard work, and determination eventually wins the day. Children often feel they are the only ones facing challenges, things are always easier “for the other guy,” and they never are going to amount to anything. And of course, with children being children—which is to say, being capable of saying and doing cruel things (in the story, one horse kicks up mud in another’s face during a race)—situations involving competition can turn ugly fast. It’s easy for little ones to get discouraged under such circumstances, and here’s where they need all the encouragement they can get. Reading a book such as this (and others in Ms. Dunne’s series) is the perfect tonic for brightening a child’s day and restoring their spirits. Who doesn’t love horses? Or a chicken that wears funny hats? Who can stay sad in the face of hearing about how friends can help friends overcome obstacles. This and others of Ms. Dunne’s books inspired by her life riding and training horses are treasures to be shared with your children, books that can be read over and over again at bedtime, at the beach, in the park, or any time you’re looking for share something that will have a positive influence on your young one’s life. A wonderful tale that teaches children that teamwork, perseverance and determination will help you achieve anything you want in life. This middle-grade chapter book focuses on the life of Charlene the Star, a jumping horse, and her animal friends. Charlene and two fellow horses, Ann and Blossom, have an interesting assortment of friends that come to live near the stables. Elliott is a talented dog, Hattie, a chicken who likes to wear fashionable bonnets, Wooliam, a tender-hearted sheep, Patsy the Pig, and two new horses, Tiger Lily and Lucky Charming. At the beginning of the tale, Charlene, Ann, and Blossom notice that the new This middle-grade chapter book focuses on the life of Charlene the Star, a jumping horse, and her animal friends. Charlene and two fellow horses, Ann and Blossom, have an interesting assortment of friends that come to live near the stables. Elliott is a talented dog, Hattie, a chicken who likes to wear fashionable bonnets, Wooliam, a tender-hearted sheep, Patsy the Pig, and two new horses, Tiger Lily and Lucky Charming. At the beginning of the tale, Charlene, Ann, and Blossom notice that the newest racing horse, Tiger Lily, is afraid of getting bumped and dislikes mud on her face. Neither of these characteristics is conducive to being a winner. The three friends set up a horse training program and they slowly encourage Tiger Lily to overcome her handicaps. Wooliam befriends her and encourages her as the others train her to become a winner. Later on in the tale, Lucky Charming enters their program. He learns to enjoy racing and instill the values of good sportsmanship in others. The personification is really effective. Readers identify with the animals and their human characteristics. Children learn how teamwork, cooperation, and perseverance pay off. They come to understand that winning does not mean gloating. Self-esteem should not equal arrogance. Wooliam models self-lessness when he sets up a charitable fund to help orphans and less fortunate animals.Hard work does pay off, but success does not come without sacrifice and much effort. Instilling good values is important to us parents, nurturers and educators. Hence, we should be cognizant of the variety of methods available for the promotion of conduct and attitudes toward others and toward the self. One way to positively influence our children is to expose them to good books that are engaging, entertaining and fostering healthy approaches toward life. This is exactly why I highly recommend Deanie Humphrys-Dunne's lovely book "Charlene the Star and Hattie's Heroes", which enchants and entertains while it promotes wonderful traits and virtues. The interaction between the main characters (mostly of the animal world) in the book, their thoughts, their communication with each other and the behaviors they encourage come across so beautifully, they are bound to inspire young readers. Charlene the Star and Hatties Heroes is a story about animal friends who work together to help each other be their very best. Hattie, an adorable chicken who loves wearing pretty bonnets, has the great idea to form a coaching business to help race horses do well and achieve their goals. She and her friends, a dog named Elliot, and a sheep named Woolium, help two horses, Lily and Lucky, learn lessons about good sportsmanship and hard work. "Are you a shy horse? Do you have low self esteem? Not sure where you fit in? Call l-800-Hattie 4 U. "We all have our strengths and weaknesses. We wanted to help other animals do their best and I think we did that well." This review is from: Charlene the Star and Hattie's Heroes (Paperback) Hattie is not only known for her ravishing beauty every time she wears pretty bonnets, but also has a great mind. What brainstorm idea did Hattie have, and did it help race-horses? How did Hattie and her friends help Lily and Lucky? Charlene is as beautiful as Hattie, and is known for her unique jumping. Who had dreams, and did they come true? What talents did Hattie and Wooliam have, and what was 'Hattie's Star Coaching' known for? What did Charlene want to do in her spare time, and does she become successful? I highly recommend this delightful adventure to all young children, parents, teachers, and animal lovers. Deanie Humphrys-Dunne, who spent her childhood in a riding school, penned a remarkable story that's touched with humor and alive with thrills. An awe-inspiring story that will teach life's lessons as much as it will astonish the heart! The author takes the reader on an amusing adventure as the story teaches moral value, friendship, problem-solving, and challenges. A magnificent learning stimulation with adorable characters, who come to life. The unforgettable characters teach life's valuable lessons, the rewards of hard work, and how to be a good sport. Follow Charlene and all her friends in a fun-filled adventure that captures the beauty within the characters that makes it all worthwhile as each page shines with love and trust. "CHARLENE THE STAR AND HATTIE'S HEROES" is as funny as FINDING NEMO, as entertaining as CHARLOTTE’S WEB, and as exciting as CHICKEN LITTLE. b>I love this and all of the books by Deanie Humphrys-Dunne. Having learned to overcome her own handicap (in "Tails of Sweetbrier"), Deanie presents a strong "can do" attitude in all of her stories. "Not giving up" to successfully accomplish your dreams is a constant theme. Each book is loaded with experiences of personal pride and happiness due to accomplishing goals by "doing the hard work". The reader is inspired at every turn. The stories are realistic, having obstacles as well as successes, and are filled with family or friends who help and encourage each other. In reading about one success after another through personal effort, the reader's personal dreams start jumping into their heads, along with the feeling of "I can do it!" - "is that all it takes? Perseverance and hard work? I can do that!!" Thank you, Deanie, for the constant reminder to ourselves and our children that a successful, happy life is within our reach when we put for the effort to accomplish our dreams. This is a wonderful little book about a group of barn animals and is told by a bunch of barn animals. The story is about how a group of animals that help and support each other. The group really helps each other as they set up a coaching group to help others. They are very supportive of each other and constantly compliment and reinforce each other’s good qualities. I think this is great book for children to help them see that by supporting each other they can really help many situations become positive rather than negative. As I was reading this book, I thought it reminded me a bit of Charlotte’s Web in the way the animals supported and helped each other. When I first started reading it, I was a bit confused and didn’t realize it was the actual animals talking. Once I figured that out, the book moved along seamlessly. It is a well written book on a level that children can easily understand. I was hoping the book would have more pictures of the characters in it. I was gifted this book for an honest review. I really enjoyed the book and the positive message it presented. We really need more books like this book out there for our children to read and learn from. This is a sweet and endearing tale about a beautiful horse, named Charlene, who seeks to pursue her dream to be a champion jumper. She befriends other animals, Woolam and Hattie, along the way who help and encourage Charlene on her road to success. Charlene in turns assists her fiends in their adventures. This author is a champion equestrian who knows horses well enough to speak for them in her stories. Children will learn patience, kindness to others and understanding the differences amongst oth This is a sweet and endearing tale about a beautiful horse, named Charlene, who seeks to pursue her dream to be a champion jumper. She befriends other animals, Woolam and Hattie, along the way who help and encourage Charlene on her road to success. Charlene in turns assists her fiends in their adventures. This author is a champion equestrian who knows horses well enough to speak for them in her stories. Children will learn patience, kindness to others and understanding the differences amongst others. The story demonstrates that with perseverance and determination you can reach your goals. Deanie Humphrys-Dunne is a Mom's Choice award-winning children's author who loves writing captivating books that teach children life lessons. She has 6 books published: "My Life at Sweetbrier, "Charlie the Horse," "Charlene the Star," "Charlene the Star and Hattie's Heroes," and "Charlene the Star and Bentley Bulldog." Her first book, Tails of Sweetbrier, has been replaced by the expanded version, Deanie Humphrys-Dunne is a Mom's Choice award-winning children's author who loves writing captivating books that teach children life lessons. She has 6 books published: "My Life at Sweetbrier, "Charlie the Horse," "Charlene the Star," "Charlene the Star and Hattie's Heroes," and "Charlene the Star and Bentley Bulldog." Her first book, Tails of Sweetbrier, has been replaced by the expanded version, "My Life at Sweetbrier". "My Life at Sweetbrier" details Deanie's childhood on a horse farm. What if your single passion was to become a champion equestrian? But your parents were told you'd never walk. What happens next? Will a failed racehorse and a handicapped girl become a winning team? This true story will inspire your child to never give up on his/her dreams. 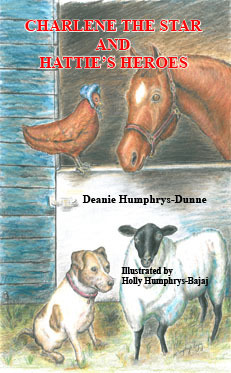 Deanie's other books are told by the farm animals. They're humorous stories you child will love. Deanie was featured on WTNH.Com/CTStyle television program. Please stop by Deanie's new website:www.childrensbookswithlifelessons.com. You'll find inspiring stories about real-life children there! Silver medal in Reader's Favorite Awards for "My Life at Sweetbrier."